Enjoy a previously unimaginable level of image quality in your home with a next-generation OLED TV. And the benefit to your home's interior is that the TV can be placed very close to the wall. That's why Vogel's has designed additional OLED wall mounts especially for these thin TVs. Vogel's THIN 546 Full-Motion Wall Mount - This wall mount benefits from all the unique features of the THIN series and is the thinnest wall mount of all. It supports screen sizes from 40-65 inch (100-165 cm) and has a maximum weight capacity of 30 kg. Depending on the width of the screen, the turning angle can be up to 180 degrees. Vogel's NEXT 7356 MotionMount – This motorised full-motion OLED wall mount is a part of the NEXT series. The mount moves automatically and is operated via an app. It is ideal for OLED TVs ranging from 40-65 inch (100-165 cm) and has a maximum weight capacity of 30 kg. If you choose a NEXT mount, you are not only choosing a lovely wall mount, but the very best! 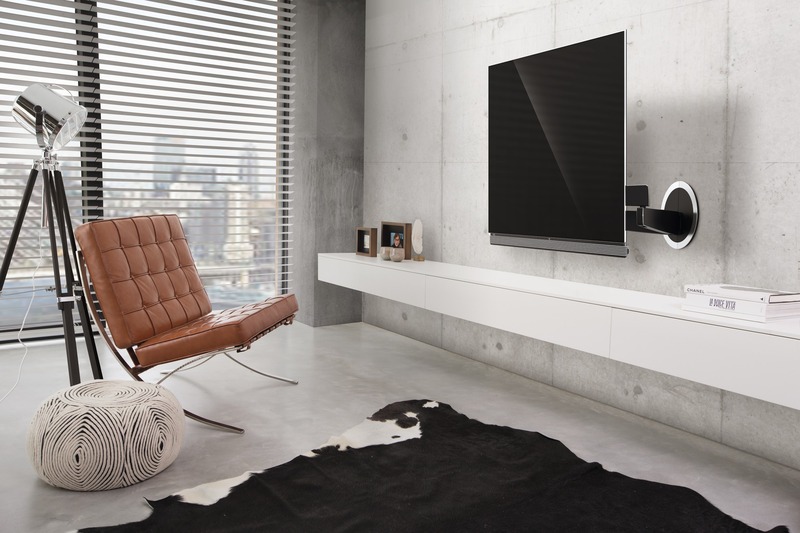 Previously, Vogel's introduced the NEXT 7346, especially designed for the most popular LG OLED series: LG OLED G6, E6, C6 and B6, B7, C7 and E7. LG OLED TV screens are extremely thin because OLED TVs do not use the background lighting technology that makes other TVs thicker. Enjoy unprecedented quality of contrast and sharpness, even with fast-moving images. And if you mount the TV to the wall using a Vogel's mount, you can also enjoy unparalleled convenience and the best viewing experience. In addition to OLED wall mounts, Vogel's also has a wide range of other TV mounts. Wall mounts are available with various functionalities. TV mounts that go flat against the wall or that you can tilt; ideal for in the bedroom if you want to mount your TV a little higher. We also have a large selection of full-motion TV wall mounts. What began as a personal quest for perfection has evolved into a successful international company, producing a highly distinctive range of mounts and mounting systems for audio, video and multimedia equipment. Since the development of the world's first speaker wall mount in 1973, this Dutch company has regularly produced award-winning solutions that make life easier for people. Nowadays, Vogel's is known for a range of products, including its high-quality wall mounts for TVs, speakers, projectors and tablets.